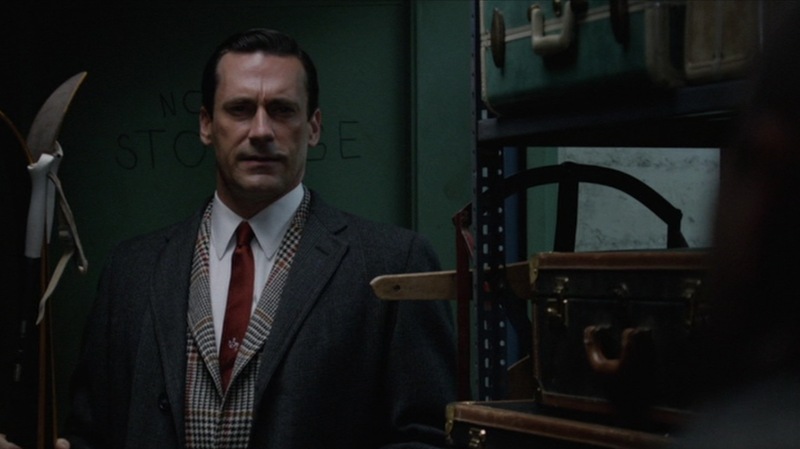 Jon Hamm as Don Draper in “The Doorway, Part 2” (Episode 6.02 of Mad Men). 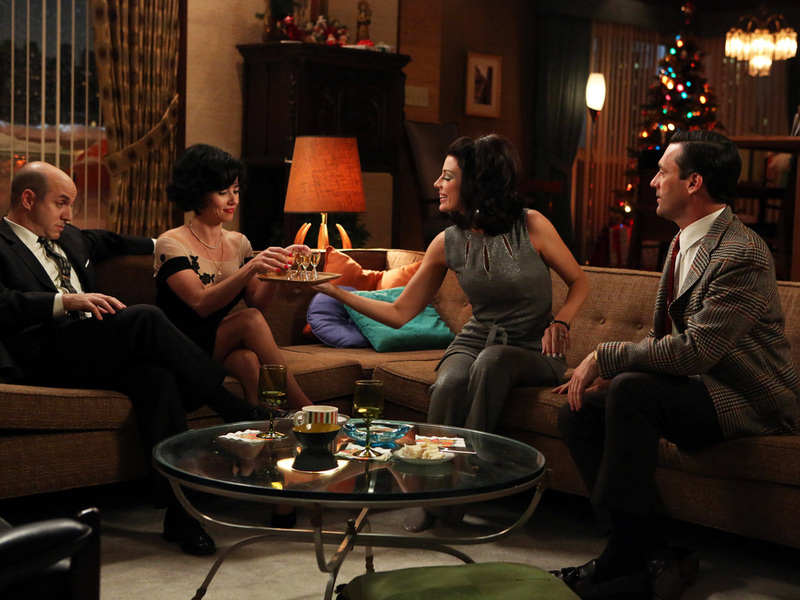 Mad Men‘s penultimate (or pen-penultimate, depending on how you look at it) season begins in Hawaii during the Drapers’ tropical vacation but soon shifts back to the cold harsh reality of Manhattan in December. While this sort of setting would have been idyllic a few years earlier during the Rat Pack era, it is now dominated by unwashed squatters living with teenage runaways and their violins. Across the city from Greenwich Village, the Drapers and their neighbors take refuge and indulge themselves in a more traditional New Year’s Eve celebration with wine, fondue, and slides from the recent trip to Hawaii. As hosts of this snowed-in get together, Don and Megan are a very popular Ken and Barbie, going through the motions with corny jokes and toasts to the new year. 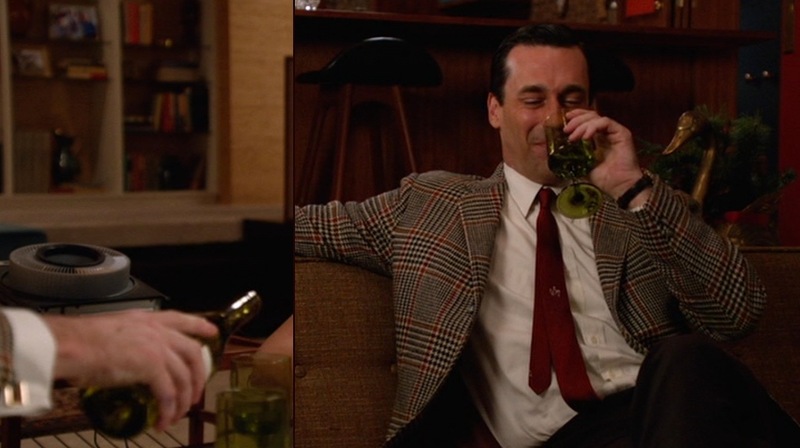 Of course, this being Mad Men, there’s always something else beneath the surface. In this case, it’s Don and Sylvia Rosen beneath Dr. and Mrs. Rosen’s bed sheets. Sylvia, Don’s paramour-of-the-season, is played fetchingly by Linda Cardellini, with whom I was enamored during her stint as Lindsay Weir on the sadly-cancelled Freaks and Geeks. 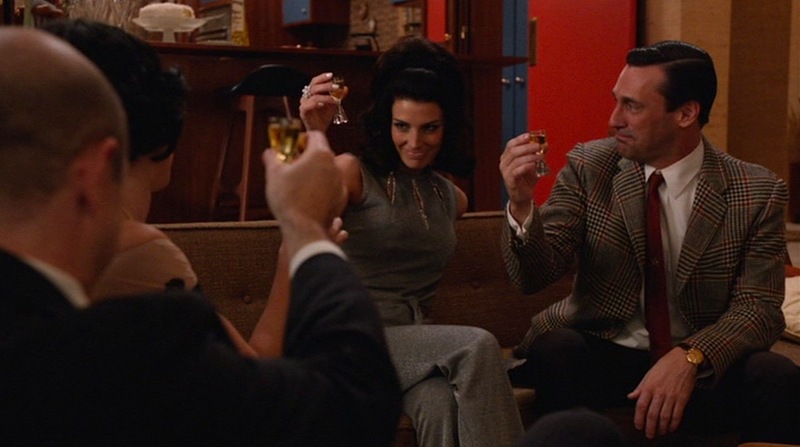 Happy New Year to all BAMF Style readers, and I hope you have a happy, healthy, and successful 1968 2015. 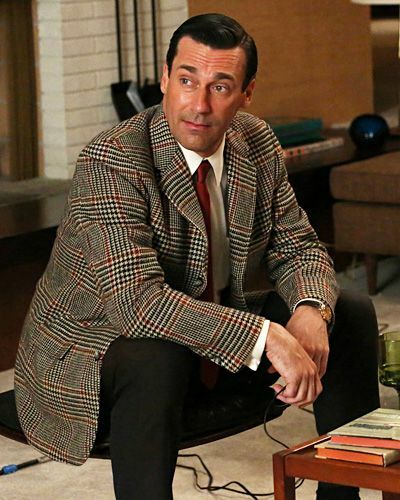 Like many men of the era, Don dresses for his casual evening in with a plaid sport coat, dark trousers, and tie. Plaid sport coats emerge throughout the show as Don’s casual wear garment of choice when the formality of a suit isn’t required. 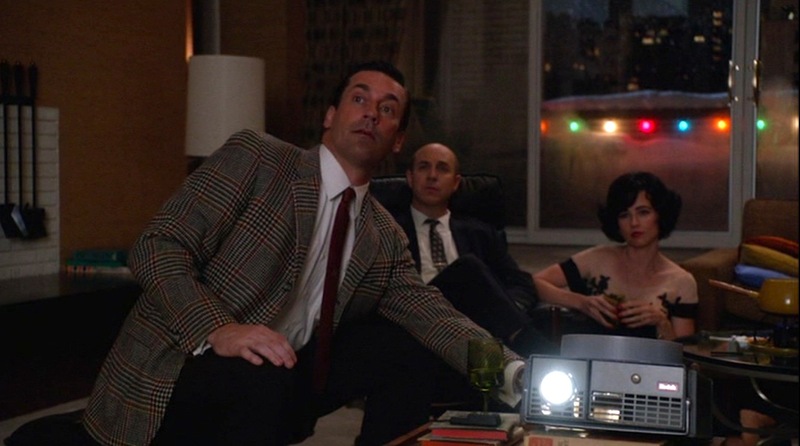 Although Don’s guests are wearing suits, it is his prerogative as host to wear whatever is comfortable and fitting. The heavy wool sport coat has a large-scaled black and cream Glen Urquhart check with a red windowpane overcheck, nicely accentuated by his red tie and the coat’s own burgundy lining. The jacket itself is single-breasted with a 3-button front, although the notch lapels roll over the top button, leaving the center button most functional. It has a comfortably large fit with padded shoulders and roped sleeveheads. It is also ventless. Don’s sport coat has his usual pockets – a welted breast pocket and straight flapped hip pockets – with one button on each cuff. Don finds some use for the Carousel after it brought Harry Crane to tears five seasons earlier. Don wears a pair of dark brown wool trousers with his sport coat. Not much is seen of the trousers other than the plain-hemmed bottoms and the fact that they have belt loops. Given their fit and Don’s preference, they are almost definitely flat front rather than pleated. Don wears a crisp white cotton shirt no different than his usual dress shirts with its point collar, front placket, breast pocket, and double cuffs. The cuffs are fastened by a set of gold square links with a brown faux wood rectangular stone in the center. As one would expect, Don imbibes heavily on New Year’s Eve. 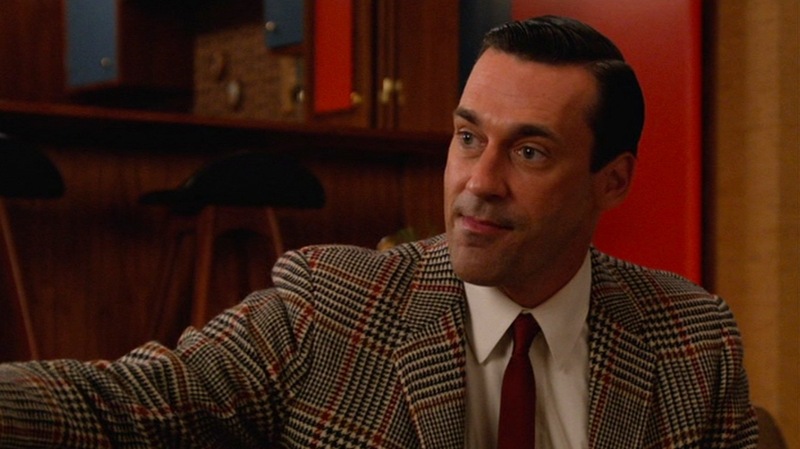 Don’s slim silk necktie is is a deep red that nicely brings out the overcheck in his sport coat. There is a small white “squiggle” pattern in the center that likely has some significance to the tie manufacturer. The only descriptions that I and my girlfriend could muster is that the pattern looks “sorta like Texas” or a “distorted fleur-de-lis”. Any ideas on the tie design? As he doesn’t need to worry about going outside into the snow, Don chooses a pair of comfortable black leather tasseled loafers with black dress socks. 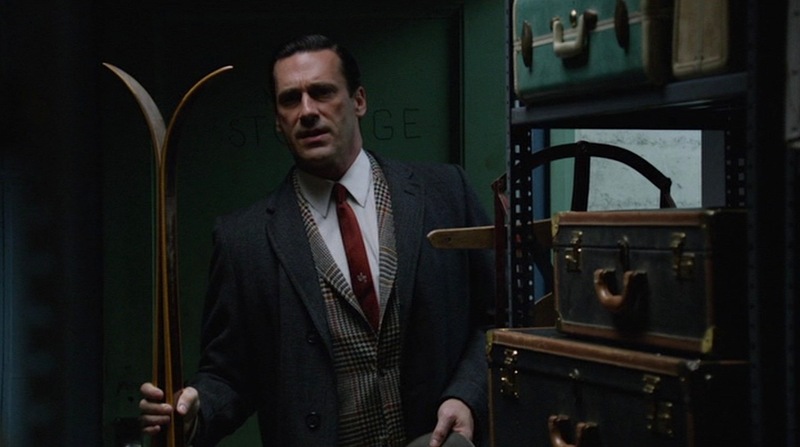 When he accompanies Dr. Rosen down to the basement, Don puts on his standard winter overcoat, a dark charcoal topcoat constructed of heavy wool with a subtle glen check. It is single-breasted with notch lapels and 3-button front. The edges of the lapels and pockets are swelled, and the coat also features flapped hip pockets, cuffed sleeves, and a long single rear vent. A gray glen check scarf, which he is seen wearing in other scenes, is stuffed into the topcoat’s outer right pocket. In keeping with his guise of going outside, Don sports his gray felt short-brimmed fedora. 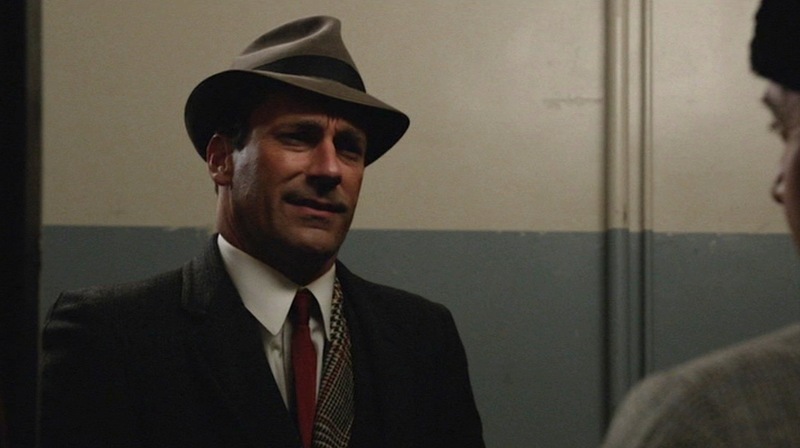 1967 was already well past the heyday of American men’s hats, so Don’s hat is stuck with the slim black grosgrain band and high pinched crown that was so popular in the earlier years of the decade. Don’s usual iconic Omega Seamaster Deville is absent in this scene, replaced by an all-gold watch on a dark brown leather strap. Not much detail is provided about the watch other than the round gold case and dial. Don brings out his gold watch for the New Year’s party. The Drapers and the Rosens toast the new year with glasses of Galliano, a sweet Italian herbal liqueur received as a gift from “Jonesy” the doorman. (Though a surname like “Jones” may not indicate an expertise in Italian liqueurs, actor Ray Abruzzo’s previous role as Carmine Lupertazzi, Jr. on The Sopranos clues us in a little further.) Galliano can certainly be consumed straight, as the New Year’s guests do, but it is also the crucial ingredient in the Harvey Wallbanger cocktail that differentiates it from a Screwdriver. 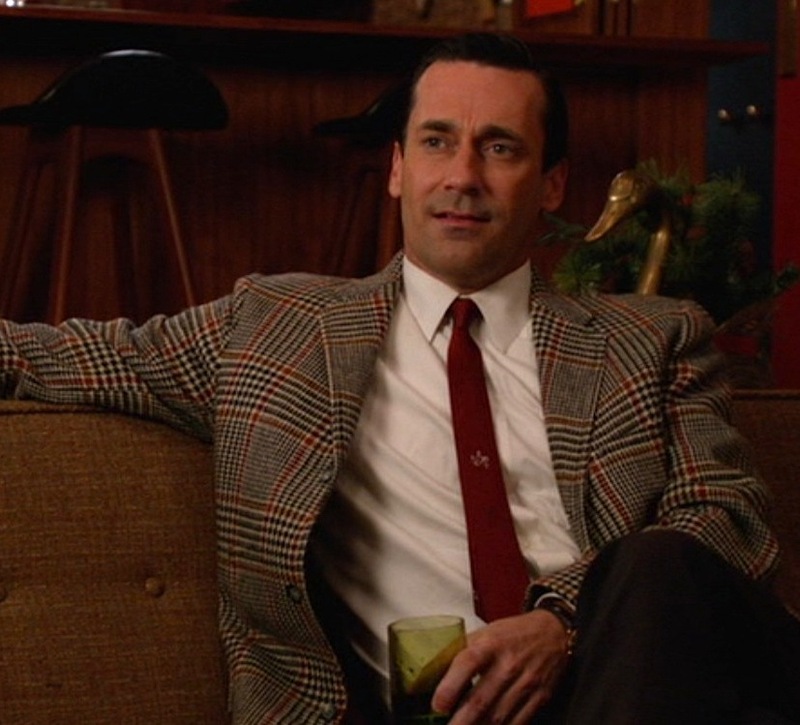 Don dresses nicely for an evening at home with friends, using the red in his jacket and tie to call out the holiday without being too showy about it. Comparing his attire to his male houseguests is an example of how a sport coat can “outdress” a full suit. Check out the sixth season. I want to stop doing this. That was a great episode. And I too thought Sylvia Rosen (Linda Cardellini) was a real honey. (Belated) Happy New Year, LS!